The Imaginative One loves French fries. He is the biggest French fry stealer so when I made these and he kept trying to take wedges from various family members, I knew this was a hit! They were so crispy which is the way I love them. I ate them without any condiments because they were that good! spices to taste – I used seasoning salt, black pepper, and Himalayan pink salt. In a med. bowl, whisk together spices and egg white. 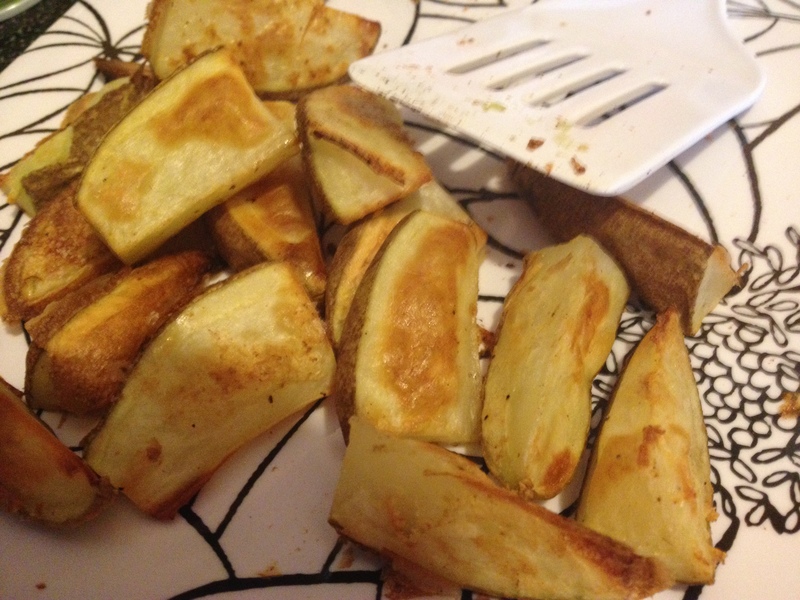 Dredge the potato wedges in the egg white – spice mixture. Coating all of the wedges. Bake for 15 minutes. Flip the wedges over. 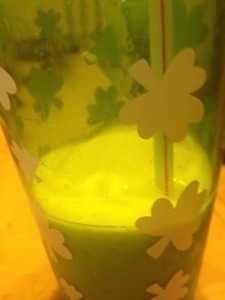 Oh my goodness, I found a recipe that made the Shamrock shake healthier with fewer calories. It’s full of good fats. One of the ingredients might surprise you. 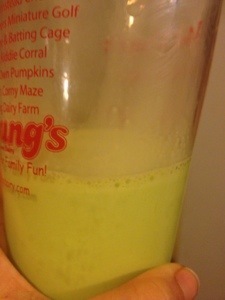 It gives you the green coloring without food dye. 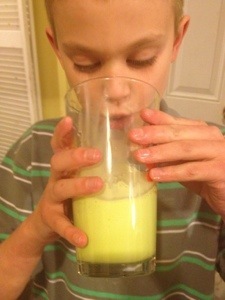 Now when the boys have their Homemade “Shamrock” shake, I can have this instead. Yeah! Oh, it’s also husband approved. Put ice in the blender. Crush it. Add the other ingredients to the blender. Blend it until all the ingredients are incorporated. 11. Hubby – He’s been such a brave soul trying the new foods I’ve been cooking. A lot of them, he’s actually liked 🙂 Yeah! 12. My favorite book series – Leslie Meier’s Lucy Stone series, Joanna Fluke’s Hannah Swenson series – I love visiting my “friends” and catching up with them. 13. Spring is almost here! It’s a time of rebirth and renewal. 14. My family – They are very important to me. 15. Foodie Pen Pals – I’ve done it in October, November, January, and February. I love shopping for a new person and trying to figure out their likes and dislikes. Then I get my package in the mail and I get to try new foods from different places in the US. Okay my last one was from five minutes from the house. This month the person who is sending me my box is from further away so that’s exciting. 16. Going to the beach this summer – I love Charleston, SC. We finally made a commitment to go to the beach. Yeah! I get to eat at my favorite restaurant there. The boys are going to get to go to Piggly Wiggly. They want to dump sand on grandpa down there. We are going to Charlottesville, VA either on the way down or the way back. 17. the zoo – I love going there. 18. Coffee – Enough said there! 20. Being a teacher – There is nothing more fulfilling as teaching especially when the students have learned something new and are excited about it. One of my challenges for Healthy Self is to make a list of 20 things you are thankful for. It was suppose to be done on Monday. Monday was such a crazy day for me so I didn’t get it done. Yesterday I was just LAZY plus because of the changes in the atmosphere – AKA snow coming in – my head was bothering me. 1. Snow day – I’m suppose to be testing today so this does stress me out some. However I got almost half done on Monday because I knew this was a possibility. Go me because these tests are L-O-N-G and one on one with the student. 2. The Imaginative One – He always gives me a run for my money with his random knowledge. He loves to learn but doesn’t like to test (discussion in car the other day). 3. The Wee One – He had a music program on Monday night. If he had a chance, he could have directed that program. He was on top of the whole production. There is a special needs student who visits his classroom. He is so gentle and caring with the little boy. During the production, he allowed the boy to play with his tie because he knew that the little boy needed that. He also loves to learn. 4. Losing 15.5 pounds in 2 months – On Monday, a retired teacher subbed in my room so I could test. She hadn’t seen me since either September or October. One of the first things out of her mouth was “You lost weight.” Made me feel good that someone noticed my effort. I’m down 2 pants sizes!!!!! 5. Learning to eat new foods – I never in a million years would have thought I would have loved eating shepherd’s pie made with sweet potato/cauliflower mash on the top. I was absolutely delicious! I also never thought I would make double chocolate chip muffins with avocados. Actually I would never have thought I would eat avocados. 8. The Imaginative One showing affection or appreciation towards me – These moments are fleeting but appreciated. 9. Being able to cook healthy foods for my family – I constantly tell the boys how lucky they are their mom cooks them dinner. 10. Photography – I love looking at nature in a different way when I’m taking photographs. Nature is cool! I also love taking pictures of the boys growing up. I have a few pictures of my childhood. I really wish I had more. My memories are visual in nature and I really wish I had the picture to go with my memories so I could share them with the boys. My absolutely favorite muffins are double chocolate chip muffins. When they bring in muffins to work, I gravitate to the double chocolate chip muffins. Usually they have a million bazillion calories in it though. I found a way to have my favorite muffin and still feel good about eating it. The cool thing about these muffins are there is no eggs in them. You can lick the bowl clean without any worries about getting sick. There are also surprise ingredients in it. If you didn’t tell anyone, they wouldn’t know it. Line muffin tin with cupcake wrappers (12) or spray with cooking spray. 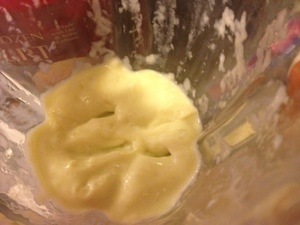 In a mixing bowl, blend banana and avocado until pureed. Add sugar, lemon juice, and olive oil. Mix well. Gradually add the dry ingredients to the wet ingredients. Mix well. The other night, the Wee One handed me a box and asked me what was in it. As I looked through it, I found blank cards and recipe cards. 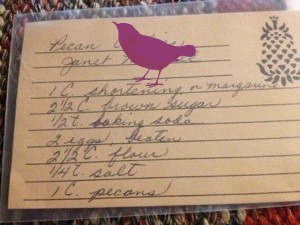 The treasure was two recipe cards written by my grandma. 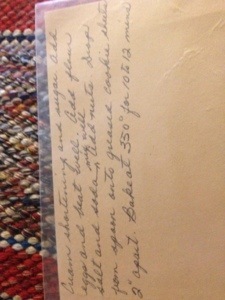 She died Christmas Eve of ’08 so it was nice to see her handwriting one more time. and walking around the pond. She was diagnosed with lung cancer in 2004 and within less than a week had passed away. My whole family misses her. 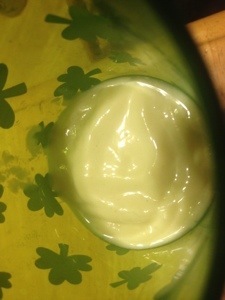 Cream shortening, margarine, or butter with the sugar. Add flour, salt, and soda. Mix well. Drop from spoon onto greased cookie sheet about 2 inches apart. Cool for about 1 minute and then remove to wire racks to completely cool.